Fellowes Desktop Reference Rack in platinum measures 21-1/8 in x 7-1/8 in x 18-5/8 in features 10 clear, plastic pockets that holds up to 20 documents. 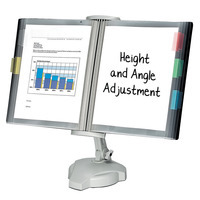 It assures stability on desk with a weighted base and keeps often used documents within reach. In this, viewing angle and height position is flexible. \It Includes attachable index tabs and can be mounted on the wall.